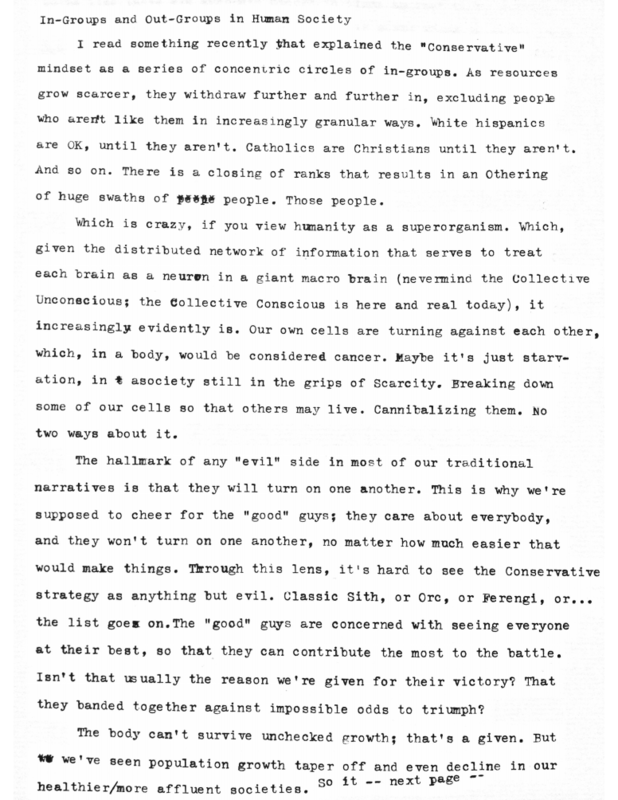 I read something recently that explained the "Conservative" mindset as a series of concentric circles of in-groups. As resources grow scarcer, they withdraw further and further in, excluding people who aren't like them in increasingly granular ways. White hispanics are OK, until they aren't. Catholics are Christians until they aren't. And so on. There is a closing of ranks that results in an Othering of huge swaths of page people. Those people. Which is crazy, if you view humanity as a superorganism. which, given the distributed network of information that serves to treat each brain as a neuron in a. giant macro brain (nevermind the Collective Unconscious; the Collective Conscious is here and real today), it increasingly evidently is. Our own cells are turning against each other, which, in a body, would be considered cancer. Maybe it's just starvation, in is a society still in the grips of Scarcity. Breaking down some of our cells so that others may live. Cannibalizing them. No two ways about it. The hallmark of any "evil" side in most of our traditional narratives is that they will turn on one another. This is why we're supposed to cheer for the "good" guys; they care about everybody, and they won't turn on one another, no matter how much easier that would make things. 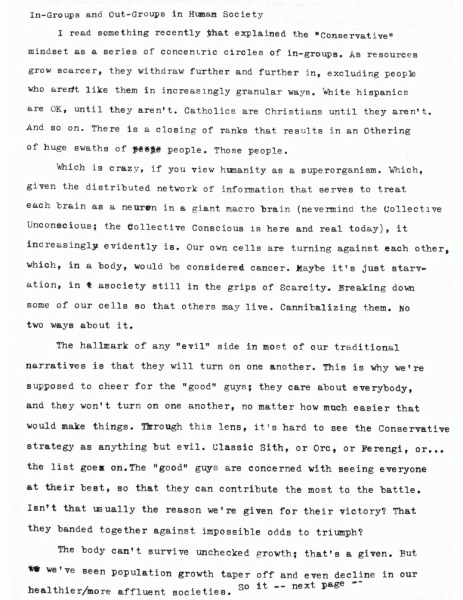 Through this lens, it‘s hard to see the Conservative strategy as anything but evil. Classic Sith, or Orc, or Ferengi, or... the list goes on. The "good" guys are concerned with seeing everyone at their best, so that they can contribute the most to the battle. Isn't that usually the reason we're given for their victory? That they banded together against impossible odds to triumph? The body can't survive unchecked growth; that's a given. But we've seen population growth taper off and even decline in our healthier/more affluent societies. So it seems like there are adequate checks in place against that. 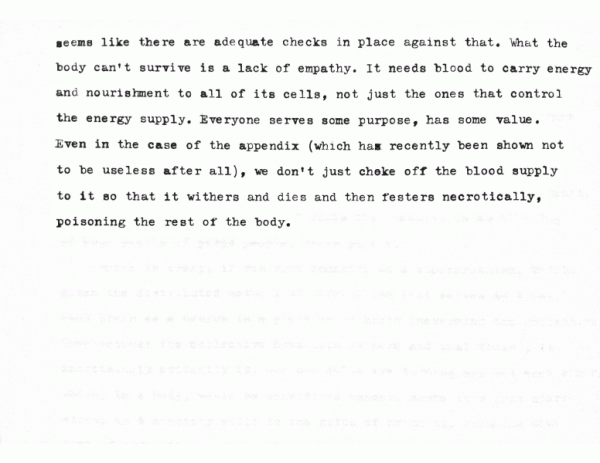 What the body can't survive is a. lack of empathy. 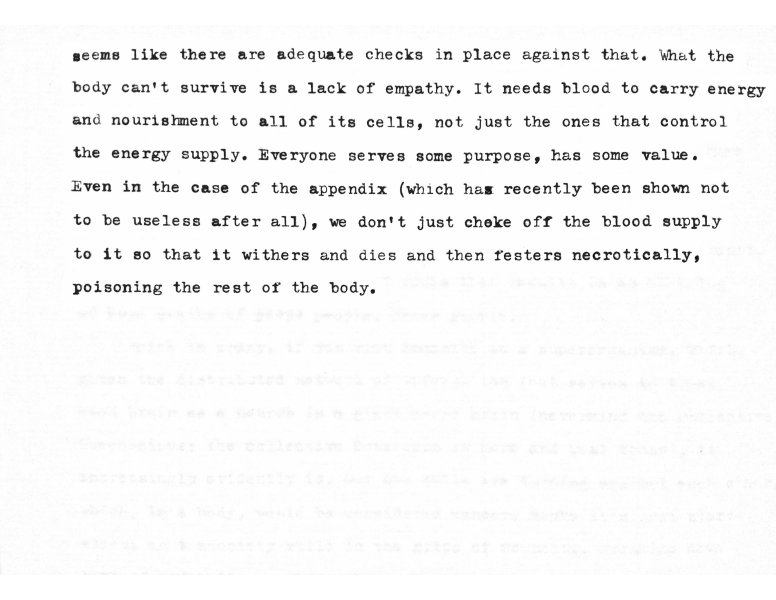 It needs blood to carry energy and nourishment to all of its cells, not just the ones that control the energy supply. Everyone serves some purpose, has some value. Even in the case of the appendix (which has recently been shown not to be useless after all), we don't just choke off the blood supply to it so that it withers and dies and then festers necrotically, poisoning the rest of the body.